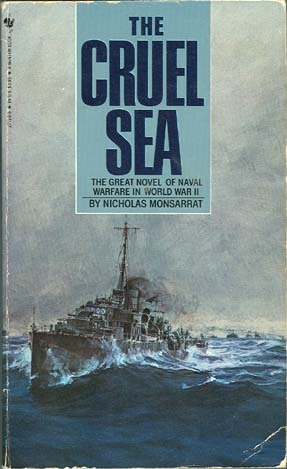 “The CRUEL SEA” By Nicholas Monsarrat. 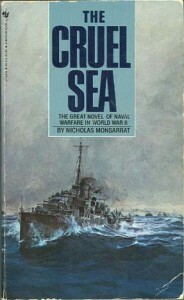 (Fiction) The Battle of the Atlantic in World War II tested men beyond the limits of endurance. Here is the mortal fury of war fought with guts and wits by men who protected the dangerous sea corridors against Nazi U-boats in those grueling years. This is the story––of one ocean, two ships and about a hundred and fifty men. It is a long story because itdeals with a long and brutal battle, the worst of any war. It has two ships because one was sunk! This novel captures like no other, the rhythms of wartime sea-life as seen through the eyes of brave young men cast in the mold of heroes facing a seemingly hopeless war. 1988 Paperback. 424 pages, no photos, maps or index.